Double dating may not totally be an unusual arrangement. In fact, there are lots of people who prefer double dating to the usual set-up. But just as in the case of a date that may contain many characters, it can also easily be ruined if the proper etiquette is not being followed. Here are some of the essential etiquette rules to follow on that next double date. Choose a couple you get along with for a double date. The last thing that you would want to have is tension on a double date. And since there are two couples involved in this set up, it is important that the two couples get along with each other in order to expect having a good and enjoyable experience on the double date. Try to choose the right couple that both you and your date get along with quite well. Plan the double date well in advance. Since it will not be a typical date, double dating requires lots of planning. In order for it to be successful, a double date should be planned in advance. The planning would require also the inputs of the other couple that you will be going along with. Some activities should be prepared as well in order to keep the experience fun and memorable. Go easy on displays of affection. Since a double date involves two couples going out, there are some things that both couples should be considering. For one, there’s the public display of affection issues to look out for. Couples should try to be considerate to the other couple in this case. PDA’s can be a source of discomfort for some couples on double dates, especially if they are not yet into that stage and just trying to get familiar with each other. To be on the safe side, couples on a double date should at least try to keep those PDA’s at the bare minimum if they expect the date to be enjoyable and fun for both couples. Try to keep everyone engaged in the conversation. 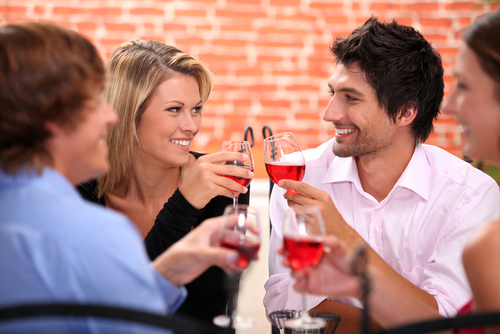 Since a double date is composed of at least four people, it is important to keep each one in on the conversation. It won’t work if one gets bored or can’t relate to what is being talked about. It is important that the conversation is something that everyone can contribute to. To be safe, try talking about general issues that will generate a lot of ideas and topics worth talking about. Try to avoid certain sensitive topics that will bring up certain tensions and disagreements. The conversations should be fun and enjoyable on a double date, not something that will cause discomfort and bad reactions afterwards.